It’s still January right? I can still reflect on last year and highlight my Best of 2016? Actually, this started out as a post about my Best of 2016 until I realized I was choosing photos for which I hadn’t yet published a story. Why not? Sometimes it was because the story wasn’t big enough and the photo was all there was of the telling. Other times, it was because the story was too big and I wasn’t up for the telling. In any event, here are some of my favorite photos of 2016 and the stories that were never published. Omoide Yokocho or “Piss Alley” is a small, iconic bar district in Tokyo. It’s not the most friendly place. In fact, one of the bars on the outskirts has an explicit “No Tourists” sign (written in English for those pesky foreigners). However, further inside the boundaries where the yakatori stalls are cheek to jowl with the izakaya bars, the hosts are friendlier and the atmosphere more welcoming. 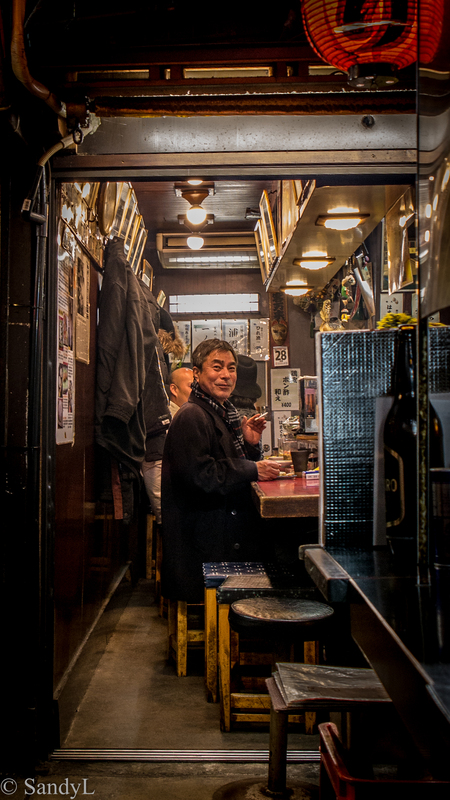 I was waiting on my kushiyaki plate and fiddling with my camera, when I noticed this gentleman across the alley. A quick nod was all I needed to take this shot. In Laos I learned some new words. Mines Advisory Group. Un-eXploded Ordnance. Little bombs. During the Vietnam war there more than 580,000 bombing missions over Laos. That’s equivalent to one bombing every eight minutes, 24 hours a day, for nine years. Thirty percent of these bombs did not explode. They remained dormant but live and were (are) hidden dangers to civilians years after the war had ended. 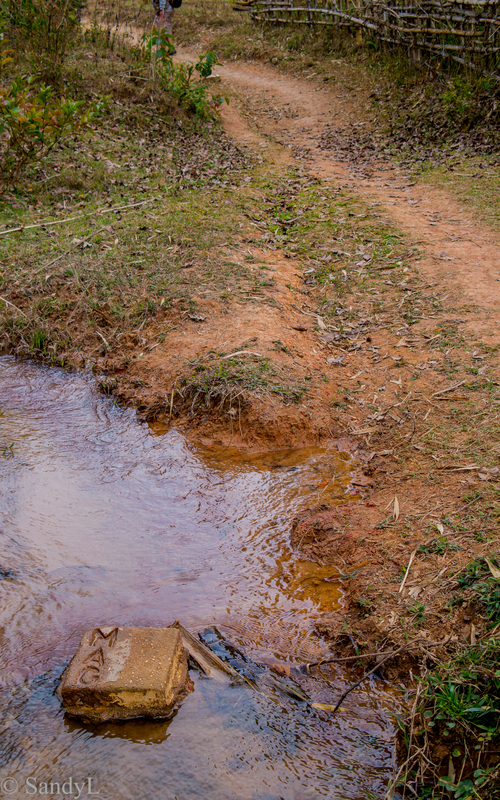 Walking through Laos we learned very quickly to stay on MAG cleared paths. Random rambling could be deadly. UXOs are still being found today. These little blocks indicate MAG cleared safe zones. They seem so innocuous. Faded rocks on well trodden foot paths. Stepping stones on quiet streams. Gentle reminders that bucolic rice fields were once war zones. Our coldest and wettest day in South Korea was spent at the DMZ/JSA. It was appropriate weather for visiting a site that was bleak, dark and overwhelmingly desolate. The tale of border patrol between North and South Korea is sad. 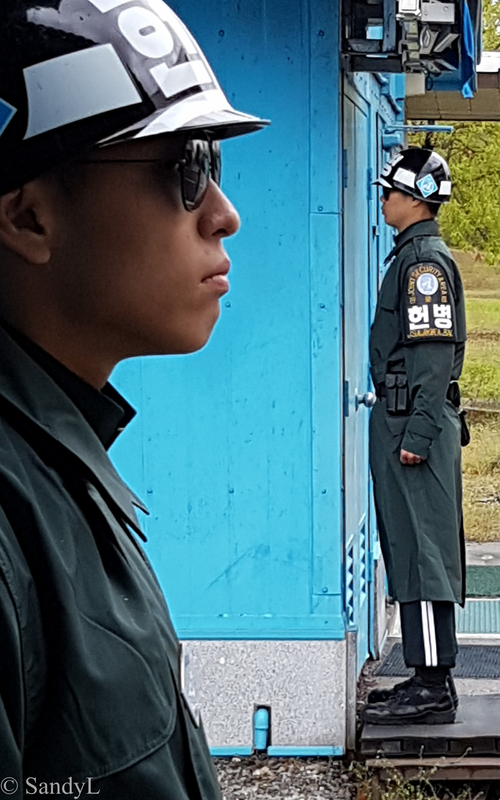 On the North side of the Joint Security Area (JSA), there’s a heavily armed soldier aggressively watching the border for South Korean attacks and North Korean defections. Behind him, a heavily armed soldier aims a gun at his head, aggressively watching him for his possible defection. On the South side of the JSA, the ROK guards maintain a constant intimidation stance. They watch the North and South side of the border. Across an expanse of about 500 meters, the South Korean guard stares down the North Korean guard. It’s a stare down that’s been on going since 1953. 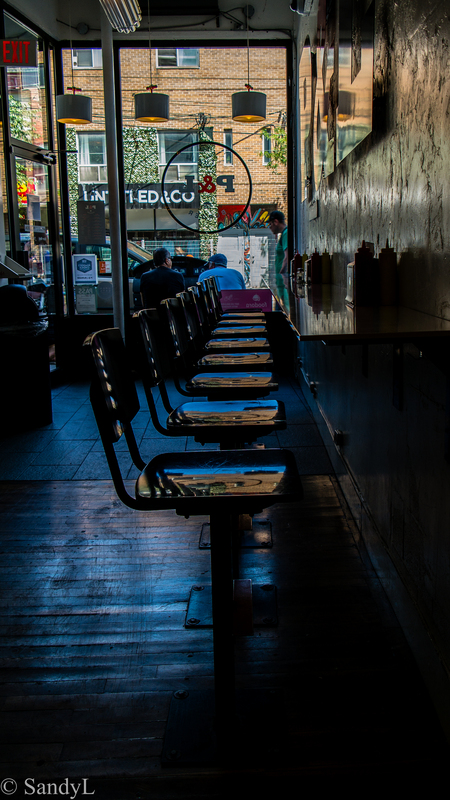 After a photo crawl through Toronto’s Graffiti Alley we took a break in a nearby Queen St diner. It had been a perfect summer day. Fresh Canadian air and brilliant sunshine. Vivid street murals which had popped with vibrancy and life. It was a visual respite to hide out in a cool and dark diner. And the burger & fries were excellent! 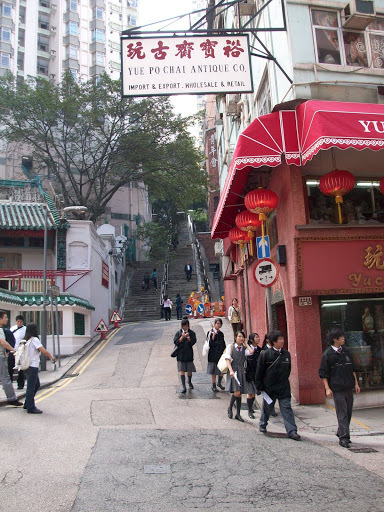 The first time I visited Hong Kong was after a year of living in Beijing. After the rough and tumble turmoil of China, I remember wanting to drop to my knees and Thank God for my return to urban sanity, order and control. Since then much has changed. I’ve lived in and visited better and worse cities. But I will always have soft spot for Hong Kong. For me, this photo captures the city’s essence. 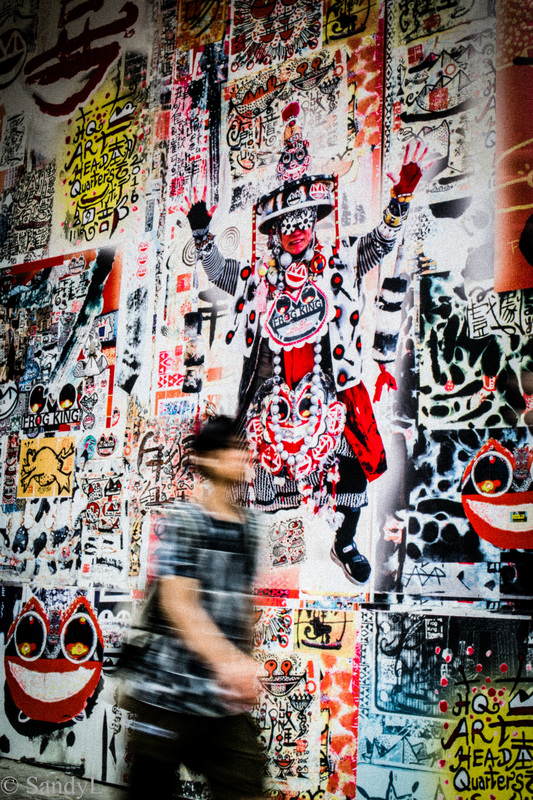 The mural’s wild graphics and kooky clown portray Hong Kong’s frenetic energy and character. The blur of the pedestrian adds the feeling of motion, a constant in this city that never sleeps. After four months in Beijng I visited Hong Kong and it was almost like coming home. I’d never been to Hong Kong before but the city breathed familiarity. Old English influence was in the street names , secluded walkways, sidewalk walls, wrought iron gates and lush tropical growth that reminded me of colonial Jamaica. Cluttered Chinese store fronts with battered doors and cool , dark interiors posted signage in indecipherable text but familiar cantonese pinyin. KwongTung, San KaTsuen .. so different from the mandarin Xi’er and Dongsishiqiao. In Hong Kong the air is musty, verdant and flavoured with salty sea breeze. 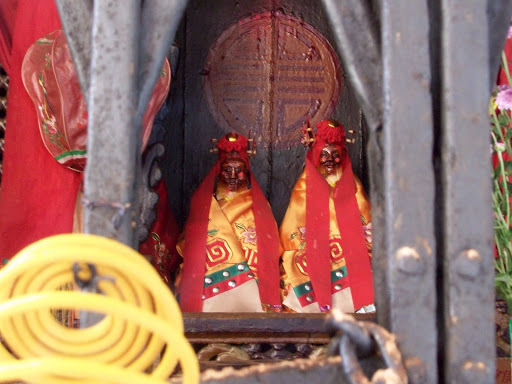 It was exotic & unusual yes – there were hidden shrines to ancient village deities and roof top temples with chanting monks -but familiar in the reverence for ancestors and the musky smell of burning incense. On the steps of temple I recognized my grandmother’s features re-incarnated in an old woman who could have been my Ja Poh forty years ago. It was as if I had stepped back in time, as if I’d been here before. As if I’d come home. A city is defined by its taxi’s. It is the first local contact when you arrive and the last as you depart. In between your daze of day tripping and sight seeing are short hops between cabs. The friendliness or curtness of your cab driver determines the pleasantness of your commute. In Thailand our cab ride from the airport was a teeth-clenching, death defining trip that had us levitating above the Bangkok roadway. In Beijing, cab rides are careening affairs that weave through traffic, traverse bicycle lanes and brush pedestrians. In Shanghai Luc texted me frantic messages stating ‘in case of death the taxi # is ..”. Hong Kong taxis are wonderfully sane. 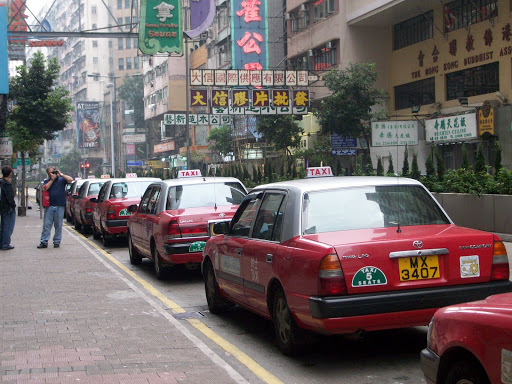 With characteristic British order, taxi’s sedately lined up in taxi lanes waiting for fares, and nicely marked taxi drop off points are marked at major shopping malls. Except for the fact that they drive on the wrong side of the road and the driver sits on the passenger side, Hong Kong taxis are a dream.